Odors in our RV come in many different forms and are caused by many different sources. Some odors are pleasant, like fresh coffee brewing in the morning, and some are not so pleasant. 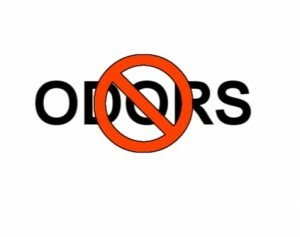 The “not so pleasant” category includes holding tank odors, pet odors, cooking, smoke, must and mildew odors, just to name a few. Some of these odors result from normal use of the motorhome and some from sitting in storage. Today I want to give you some tips on how to control and eliminate some of these unpleasant odors. Because RV’s are relatively small in size, when compared to a 2,000 SF home, odors tend to be more pronounced. Add to this the RV sits closed up for periods of time and these odor problems are compounded even more. This leads to one of the key factors for controlling odors, ventilation. Ventilation not only helps with odors, but can limit the amount of heat build-up in the RV too. A quick fix for this odor related problem is to install some aftermarket roof vent covers, like MaxxAir vent covers, over the existing roof vents. They are easy to install and a great feature about these ventilation products is that you can leave the roof vents open, even when it’s raining outside. These ventilation products will keep the air circulating throughout your motorhome and help prevent musty odors. Watch my installation video. With the ventilation problem solved we can focus on other types of odors that linger in our RV. These odor molecules aren’t just in the air, they get in the fabrics, carpets, ceiling, window treatments and other areas of the RV. Pet, smoke, and musty odors can be extremely difficult to eliminate. 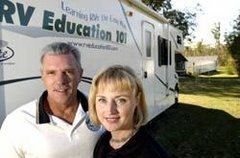 During my days of selling RV’s I witnessed RV interiors that were professionally cleaned, but odors, like smoke, still remained afterwards. I also experimented with many different odor controlling products, but perhaps the best product I found for eliminating difficult odors is Fabreze. Lots of air fresheners just mask common odors, but in many cases masking an odor won’t eliminate it. You need something that can kill the odor causing bacteria in the air, which is what Fabreze does. After RV trips, or before storage, clean the RV thoroughly and spray Fabreze throughout. Don’t forget to spray the upholstery, carpet and fabrics too. To help prevent cooking odors from becoming permanent odors in your RV make sure you turn the range exhaust fan on whenever you are cooking, and it’s a good idea to open a window too. To maximize the efficiency of the range exhaust fan keep the filter clean. On some RV’s it is necessary to go outside and open the range exhaust fan door so the cooking odors actually vent outside. Check your RV owner’s manual for more details concerning maintenance and operation of your range exhaust fan. When it’s time to put the RV in storage there are several steps you can take to assist with controlling and eliminating common household odors. First, thoroughly clean the interior of the RV. Remove all perishable food and leave cabinet doors and drawers open so air can circulate. Defrost the freezer and thoroughly clean the refrigerator. Leave the refrigerator and freezer doors cracked open. I put a small tin of charcoal in the refrigerator compartment to help absorb any odors, baking soda works well too. If you decide to leave your clothes in the RV during periods of storage use some mothballs to help control musty odors and leave the wardrobe doors and clothing drawers open to promote air circulation. This brings us to the least favorite topic when discussing odors in our RV, RV holding tank odors. The good news is there are some very effective methods for controlling these odors too, and it doesn’t involve strong chemicals that can be dangerous to humans, pets and septic systems. First it would probably be helpful to explain why we sometimes get a bad odor from the RV black water holding tank, especially when you are traveling. Motorhome holding tanks are designed with a vent pipe going from the holding tanks to the roof. The holding tank odors accumulate in the tank and can’t really vent outside because there is no air pressure to force these gasses (odors) up and out of the vent pipe. The real problem occurs when wind blows across the vent cap on top of the RV roof, which escalates when you are traveling. This higher air pressure forces air down the vent pipe pushing the tank gasses (odors) to the only other way out of the system, the toilet. Whenever the air pressure is higher inside the holding tank, than it is inside the RV, the odor escapes into the RV by way of the toilet when it is flushed. 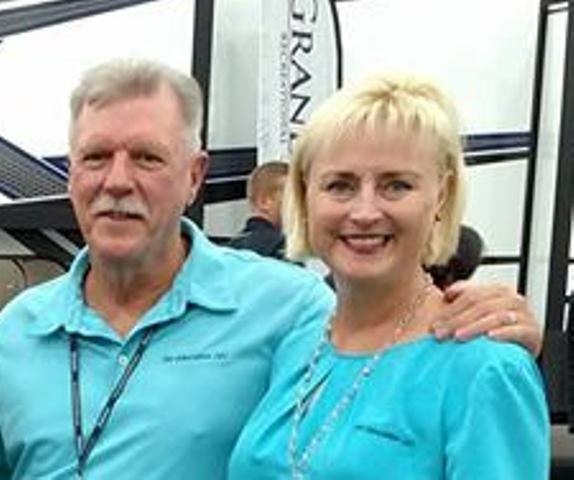 The good news is there are aftermarket RV products that will help solve holding tank odor problems caused by the design of the RV waste water system. These products are basically a redesigned breather system that attaches to the top of the vent pipe and actually draws the fumes out of the holding tank. These products work when the RV is stationary and when it’s moving. Another problem associated with RV holding tank odors is the use of strong chemicals to help control these holding tank odors. Some of these formaldehyde based chemicals are dangerous to humans, pets, and the septic systems we empty our holding tanks in to. Because little water is used, in comparison to a domestic waste water system, RV holding tank wastewater is far more concentrated. The organic strength from the mixture in an RV holding tank can be fifteen to twenty times stronger than a typical wastewater system. This problem is compounded when the RVer gets some odors from the holding tank and dumps even more chemicals in the holding tank in an attempt to control the odors. As many of you, who know my work know; I am a big advocate for saving our RV dump stations. I recommend using a holding tank treatment that is environmentally friendly and safe to use in septic systems. Enzyme based holding tank treatments, combined with a redesigned vent breather system, can effectively control holding tank odors. Don’t be afraid to put some holding tank treatment in the gray water holding tanks too. When the gray tank is empty add some water, and the holding tank treatment, to the sink drains to help keep the gray water tank free of odors. I add some dish washing liquid to the gray water tank periodically to assist with breaking down and grease and keep the holding tank clean. So it’s safe to say with proper ventilation and a few good aftermarket RV products you can eliminate all of the tough odors commonly associated with enjoying our motorhomes.